The Quaker Parrots are intelligent, comical and engaging birds. They have a wonderful zest for life that pet owners find quite contagious. They have a lively personality that emanates positive attitude towards life and the surroundings. These birds are as loyal, loving and sensitive as any human being could possibly hope to be. 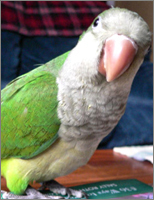 The Quaker Parrots have a natural plumage of bright green head, with splashes of blue at the sides and tail. Quakers are fast learners, rapidly picking up words and phrases that they hear often, and can frequently be heard "conversing" with themselves as they practice saying different things. Quakers can be very noisy birds. Being the mischievous and fearless creatures that they are, their natural curiosity can often get them into unbelievable pickles if they are not carefully supervised. They are considered to be the best talkers among the smaller parrots. The Quaker Parrots have quick wit and intelligence that they never hesitate to express verbally as well as socially. These green-feathered birds are well-known for their tremendous sense of humor and play. 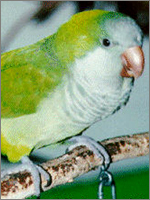 Most Quaker Parrots are packed with energy and will spend hours swinging, climbing and playing with toys. They also do a great deal of whistling and chattering, but sometimes during this process they generate high amount of noise. Whistling is one of their favorite activities and they will put great endeavor to pick up small tunes that they hear on the radio, television, or from their human flocks. This will lead to endless practicing until they achieve it. 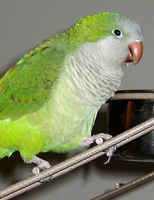 Quaker Parrots are highly intelligent and social birds. They can talk very well and loves playing little games. This is an excellent way to bond with your Quaker Parrot. However, to avoid its bored and aggressive nature, the owner should shower the bird with lots of attention and activities. A Quaker Parrot requires care and guidance like a human baby.